New Egypt Speedway keeps getting better. Saturday night's show was well run as each division put on some great racing, and all the racing was wrapped up by 9:30 or so. 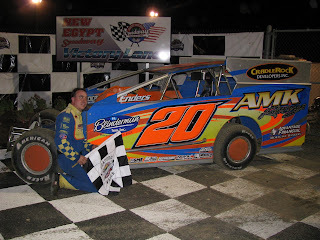 Rick Laubach earned his second Modified victory of the season after a hard fought battle with John Guarino. Scott Dugan won the Outlaw Stock feature for what I believe is his very first win at New Egypt Speedway. 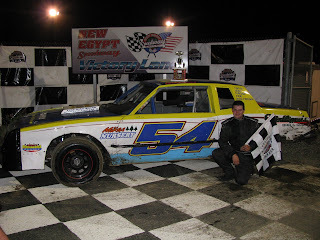 For complete results go to newegyptspeedway.net. Here's some Modified heat video from last night. Tim Tanner's engine lets go with no warning, and Rick Laubach and John Guarino battle it out.